This unmistakable imposing profile reveals a brand new, hand wound stripped-back movement, as Audemars Piguet maintains a steady course with another stunning evolution of the Royal Oak Offshore Tourbillon Chronograph. The only chronograph watch among the six pre-selected finalists in the 2017 GPHG Tourbillon and Escapement category, the Royal Oak Offshore Tourbillon Chronograph is also the only one with strong sporty overtones, and in its prominent sandblasted 44mm titanium case, in terms of presence it is a leviathan among its peers here, yet throughout this beast there is much subtle beauty in every detail. With sleek black ceramic chrono pushers and crown, sapphire dial with subtle orange flicks, and its defining classic design DNA encased in lightweight titanium the Royal Oak Offshore Tourbillon Chronograph is a coming together of bold contemporary styling and pure horologic tradition. On the basis of modern aesthetics, only Bulgari's Octo Finissimo Tourbillon Skeleton compares, while the others are more classically nuanced, except for the ethereal otherworldliness of the D. Candaux First 8. 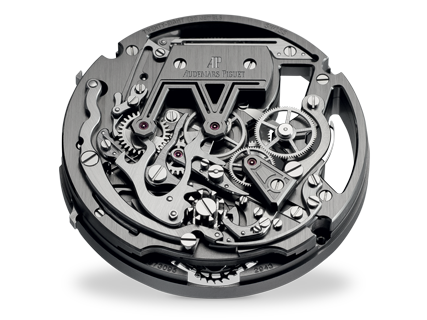 With the new hand winding Calibre 2493 beneath a clear sapphire dial, Audemars Piguet have been able to fully open up the movement to create a watch with a three dimensional 360° view of the integrated 30-minute chronograph, amid the stripped-back grainy black frame, and in particular the spectacle of its one minute tourbillon with a big ruby right at its heart. To say that it's an eye catching watch is a bit of an understatement. Do we think it can win? So, with no obvious trends among prizewinners in recent years, other than the art of the technical innovations, all six contenders in the group must be considered as potential winners, and that makes a decision very difficult, so I almost expect not to get even close in this category. There is no doubting the drama and presence of the Offshore, and the very desirability of Audemars Piguet which guarantees watchmaking excellence is an irresistible lure to many, but even with its brand new movement, is it enough to claim the Aiguille? I don't think it is.